The development of personal consciousness is a process for awakening the self-awareness on 4 levels in the life experience: physical, psychic, mental-cognitive, and noetic or spiritual. The awakening process works exclusively with consciousness, avoiding culture specific references and minimizing the terminology and dogma associated with spiritual systems or religions. While trying to avoid the trite, clichéd, and worn-out terminologies of various Christian denominations, nevertheless, the foundation of this system of learning focuses on the living dynamics of the Holy Trinity to awaken us to the presence of the Christ Light within. Simply stated, in the experience of being in a physical body in third-dimensional reality, our egos become “outward looking” by utilizing the 4 senses in the head (sight, hearing, small, taste) and touch so our orientation to life, people, and the world becomes totally externalized. In our journey from birth to adulthood, we experience 4 very different stages of conscious development in infancy, childhood, adolescence, and maturity. By the time we are young adults, we have a vast and complex array of experiences in our life: in the growth and development of our bodies; about family members, friends and the socialization of people in the world; about the educational, religious, judicial and political systems which govern our society; and about the world and universe in which we live. What we don’t have is Self-knowledge! In order to awaken from this “delusional dream world,” one has to consciously recognize: that there is another reality in this life which can be accessed; this reality is present here and now; in order to experience this reality one must “turn-off” the external world. Turning off the world is as easy as sitting down, relaxing, closing the eyes and getting quiet within. Someone who is unfamiliar with this awakening to internal reality will find that the challenge is maintaining the quietness. Actually, this new awareness is the first awakening – it is the recognition of how noisy and undisciplined is the “chattering mind” of the ego-persona. This is an important first step, a major success, and a critical time to make a commitment to continue this journey; your life and soul depends on it! Making such a commitment means making the decision to enter the Way of Life as explained to us by Jesus Christ. Remember, Jesus did not come into this world to teach us a religion, but he showed us how to live, how to love and how to be. Religions provide us with a framework of morals and beliefs, and the Bible provides us with the teachings of Christ, but to experience the reality of these teachings, we must get control of the noisy and willful ego-persona and learn how to properly manage the unruly desires and impulses of the physical body. Christ tells us that the Kingdom of Heaven is within and to experience this sublime state of Light, one must learn how to be quiet, still and peaceful within. In this serenity, we can experience the kind of self-knowledge which comes from communion with Christ and internalizing an understanding of the Holy Trinity. Galileo once said, “We cannot teach people anything; we can only help them to discover it within themselves.” Living and functioning in a multi-dimensional universe requires perceiving and understanding the various facets of life from different perspectives as well as understanding the interrelationships of these variables. As an example, there are many different perspectives from which the human body can be known. The body is most commonly understood as a sensual mechanism which consciously experiences stimulus and sensation from the external world; this is what we know as touch (touch is not perceived through a sense, but through consciousness). It can also be known as: a living system of organic activity as the biologist understands it; it may be perceived in its delicate balance of chemical compositions as a nutritionist would see it; or it might be seen through the eyes of a surgeon as individual component parts. Our individual states of consciousness are also subject to varied classifications based on function, levels of understanding, and dimensional perception. Although there are common terms used in association with consciousness such as conscious awareness or unconsciousness, consciousness is perceived and experienced as something uniquely different by each individual person. Most people think of consciousness as “my consciousness,” and simply use this awareness to accomplish their personal agendas, never giving thought to what consciousness is, how it functions, or how it is they are conscious of consciousness. People tend to base the condition of “their consciousness” on the physiological and emotional states that are constantly being monitored in the body, or on the tenuous circumstances of their lives. Consciousness is most commonly thought of in terms of bodily sensations and through sensory experience, but it can also be known internally as states of being. These different experiences of consciousness through an internal or an external orientation define the two methods people use to relate to God or to the divine states of being within. In other words, people not familiar with the internal states of being most often direct their “questioning consciousness” outwardly to an external source such as their concept of God. In so doing, they are attempting to receive subjective understanding in a similar manner as they receive information from the physical realm, that is, objectively. Without realizing they are doing this, their belief system perceives God the same way as they perceive the objects of the physical world, thus, they are trying to understand subjective reality in objective terms. People who are oriented to external reality believe the objects they perceive in this world with their senses are real, consequently, they believe, with the same deep conviction, that their “externally-oriented” concept of God and heaven is real. Sadly, the effect this belief has upon their life means they will not experience heaven until they die. People who understand the internal states of consciousness turn their attention inward to find answers to their questions about life and God because they recognize consciousness as the source for their answers and the source of their spiritual experiences. These individuals realize that their consciousness is actually connected to and one with Divine Consciousness. They know how to be receptive to intuitive knowledge and divinely inspired insight inherent in consciousness, and they know how to modify their internal state to be peaceful and still so as to experience the Kingdom of Heaven within. These people realize and accept responsibility for their lives, the condition of their conscious state of being, and for creating the circumstances of their lives. Although they know God is within and without, they do not look to an external, objective source of divinity because they prefer the internal closeness and presence of the Christ Light and Love within. Of course, people don’t realize they are formulating these misperceptions. They do not understand that the perceptions being formed from every day experiences are flawed because they are being filtered through their own pre-existing prejudices, delusions, pain, insecurities, and fears. Neither do they realize that they continuously accept, incorporate, and use information, insights, and beliefs from other people that are inaccurate or incomplete. In sum, unless people make a conscious effort to recognize and break free of their misconceptions and illusions, they will experience a distorted and inaccurate picture of reality. Unconsciously, many people realize that they see through the glass darkly, but they have no idea what to do to remedy this condition. In order to give the appearance of functioning competently in life, they adhere tightly to their current perceptions in hopes they are right. This effort is an attempt to maintain their self-image, which is a reflection of their self-concept; the self-concept being a collection of perceptions, both seen and unseen, about oneself in relationship to other people and to life in general. This effort to consolidate the self-concept gives one a sense of confidence and stability against the forces of the world; this is a defensive or protective behavior. Consequently, people will fiercely defend their misconceptions and misunderstandings about life in order to maintain their self-esteem and/or their self-righteousness even though such a condition often obstructs new learning and personal growth. In the awakening and reorientation of consciousness, the individual recognizes that misconceptions and misunderstandings are dangerous illusions which prevent one from seeing and experiencing life as it is meant to be. It is about realizing that while everyone has his or her share of misconceptions, the appropriate thing to do is to let go of them as soon as they are recognized. Albert Einstein said, “We must learn to differentiate clearly the fundamentally important, that which is really basic, from that which is dispensable, and to turn aside from everything else, from the multitude of things which clutter up the mind and drive it from the essential.” Reorientation is about being humble enough to release worldly delusions and to attempt the reordering of one’s perceptions so that they are aligned with the essentials of reality. In other words, it is making a continuous effort to let go of personal delusions and to see life as if one perceived it through the eyes of God. The universe is perfect in its manifestation; it is guided by laws and principles that are infallible. At the core, the members of humanity are perfect in their manifestation. Not only are they governed by these same laws and principles, but they also have the capability of utilizing these laws to enhance their life experience. As humankind becomes knowledgeable of universal laws and incorporates them into their consciousness, our experiences become more harmonious, balanced, and synchronistic with all of life. When life is lived according to universal laws and the inner spiritual nature is clearly understood, the mental and emotional makeup of a person will be stable and clear, and self-perception will be true. The axiom “as above, so below” is helpful in understanding how these laws and principles which apply to the macrocosmic universe also apply to the individual’s microcosmic universe. The unified relationship of life enables those who seek this knowledge to realize that Creation “below” is configured like Creation “above,” and Creation “above” is revealed in Creation “below.” There is one common Light within all living systems from the atom to the galaxy, and all such forms are governed by universal law. As above, so below means that each human is a micro universe which functions according to the same laws and principles as the macro universe. In order for humanity to fully participate in their divine heritage, they must reorient their thinking, perceptions, and actions so they are congruous with the operations and laws of the macrocosmic universe. Individuals will know they are successful in this reorientation process when their life experiences are fruitful, harmonious, and trouble-free. This requires that people let go of who they “think they are” so they can become who they “truly” are. Surrendering to the divine essence within awakens the unlimited potential of the spiritual nature revealing higher levels of consciousness. Spiritual guidance has been communicated to humanity at different times, in different ways, and by different teachers, but its message is the same, “Man, know thyself.” This saying is as old as humanity itself. By seeking knowledge of self, we will come to understand the world of consciousness and energy in which we live. We will understand that we are energetic beings comprised of knowing, thinking, and doing intelligence which is integrated into the “seemingly solid” energetic matter of the physical body. Reorienting the awareness to these multi-dimensional states of consciousness is to awaken new possibilities which are available when the creative potential is fully realized in the physical body. Another message which has been communicated through the various religions of the world is that humans are created in the image and likeness of God. This is one of those issues about which many people believe, but don’t really know. In this case, it doesn’t really matter what is believed because it doesn’t change the reality of what is. Humanity has, in fact, been created in the image and likeness of God; that image and likeness is eternal, creative, intelligent Light in a miraculous body which is a perfect, symbolic reflection of that living Divine Light. God has sent humanity numerous examples of individuals who have demonstrated these divine characteristics; most notable among these is His son, Jesus Christ. Jesus even assured humanity about these divine capabilities when He taught, “These things I do so shall you do also and greater than these.” This statement affirms that each individual has all the divine qualities and characteristics of the Creator; but, at present, most of these traits remain in an undeveloped and unrealized state. How is it that the Creator has fashioned humanity with divine capabilities, and configured us to be interconnected with each other and the entire universe? Simple, the Father/Mother/God created humankind from the very essence of their being. In the beginning, the Conscious Light of Creation was One, undivided and indivisible. In the Creator’s infinite wisdom, It decided to bring forth Creation by dividing His/Her Indivisible Self. Thus Consciousness, which remains undivided and One, expresses Itself as duality in an infinite number of worlds, planes and states of existence; and then the Creator populated these worlds, planes and states with an infinite variety of God-like beings. In each being, God placed a divine spark of Light, an image and likeness of Its Indivisible Self. In this way, each being can know from whence he or she came and to whom he or she shall return. If they would only make the effort, each person has the ability to feel that connection with the Creator; we all can know and experience the presence of God within. When properly cultivated, this connection is the means of knowing the Truth! For most people, the journey of life begins in a naïve state from which the unaware conscious self is guided through a field of life experiences for the purpose of extracting the dormant potential which lies sleeping within. The school of life teaches, guides, coaxes, expands, and slowly develops its students. Some awaken quickly, while others create attachments to what they think they know, and thus develop slowly. Some become attached to the material world, and don’t want to know anything else; while others become so insecure in the world that all of their experiences are seen through fear and apprehension. As Virgil said, “We make our destinies by our choice of gods.” In the larger scheme of things, it doesn’t matter where a person begins, for all will eventually awaken and return to the Creator; some just take longer than others. God has given each person free will to make these decisions; that is, remain clueless and asleep in this world of illusion and sensory pleasures or begin to take responsibility for one’s life and awaken to the spiritual potential which lies dormant beneath the surface. Humanity has had its share of teachers, sages, and prophets throughout time that provided instructions on how to bring forth our latent spiritual capabilities. These spiritual talents manifest through our divine nature so life will have a deeper meaning and bring forth joy, peace, and continuous awakening. This awakening begins by connecting with and gaining knowledge of the greatest gift given to humanity by the Creator, the divine spark within. The divine spark is within our heart of hearts: it is the core of life and light in each individual; it is God’s image and likeness within; and it is the Intelligent Light of Consciousness manifesting as the spiritual body of man. Everyone has it; everyone is the same at the core, but not all are aware of it. Since the body of man is formed from the essence and higher Intelligence of the Creator, this means we all have qualities and characteristics from the original source of life. Of course, no individual can become God, but each person has the same spiritual nature as God, and each person has the potential to manifest the qualities, characteristics and attributes of that divine nature. As Carl Jung said, "Individuation means becoming a single, homogeneous being, and in so far as individuality embraces our inner most uniqueness, it also implies becoming one’s own self…or self-realization.” If we are courageous and embrace the lessons our individual destiny brings, maintain our faith, and walk the path of Light, we will experience these spiritual capabilities and realize our true Self within. Personal self-awareness is greatly increased when the light of Intelligence is turned inward to purge the fear, anxiety and negativity from one’s life. Liberation from the pleasure/pain cycle of duality and the realization of our spiritual nature within are the first steps to achieving Self-realization. Remember the oneness we have with Christ, for this actualizes the unconditional love within the spiritual nature. The spiritual essence within is comprised of exactly the same spiritual essence as that of the heavenly worlds; so the Light, Life, and Love of the individual microcosm are identical to that of the heavenly macrocosm. As we embrace the Light within, we embrace the Light of heaven. As we penetrate the knowledge of the internal Light, we learn the mystery and truth of the heavenly Light. In the same manner that the Earth has an energy field around it called its atmosphere each individual also has an atmosphere (See diagram below). From the atom to the stars, all living bodies in the universe behave an atmosphere. Extending the arms to the sides or front with the palms up would define the outer edge of the human atmosphere. It is shaped like an egg with the small point at the feet. 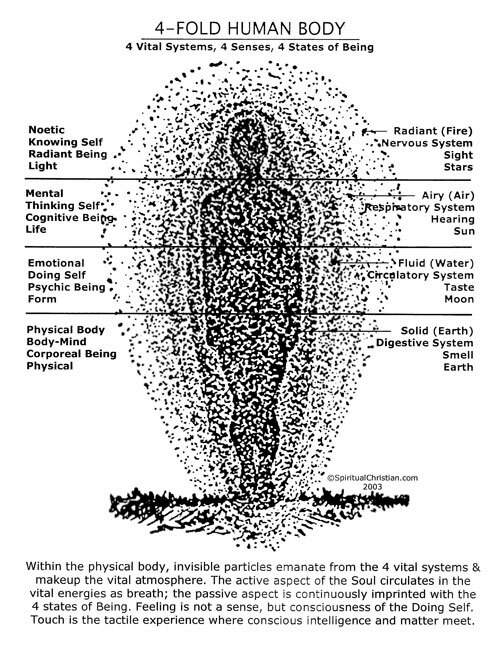 This is the energy field of the microcosmic universe. Each individual is a microcosmic universe in an infinite and unknown macrocosmic universe. It is unknown and unknowable because the immensity and complexity of the universe and God are beyond the ability of man to comprehend. However, as stated earlier, there is a way to know and understand God and the universe, and that is to become familiar with one’s spiritual nature and understand the laws and principles operating in the microcosmic universe since it functions in the exact same manner as the macrocosmic universe. For example, universal forces that operate throughout both the micro and macro universe are gravity and electromagnetism. Universal principles, on the other hand, define the orderly function of the universe; the Law of Cause and Effect is such a principle. This law is sometimes referred to in scientific terminology as “for every action there is an equal and opposite reaction” or in biblical terms, “as you sow, so shall you reap” or on the streets as “what goes around, comes around.” The Law of Giving and Receiving expresses the dynamic interchange of forces and elements that circulate and flow throughout the universe. The Law of Correspondence explains that as Creation is above, so it is below; and as it is below, so it is above. The Law of Potentiality or abundance means that the universe has unlimited potential; that consciousness has infinite possibilities; and that there is an infinite supply of creativity available. The Law of Intention is easy to understand when considered in conjunction with the infinite potential of the universe. As stated above, the universe has infinite capabilities so when an individual focuses his attention and intention on this field of potential energy, energy will move based on the nature of the intention and on the power of one’s attention. Everyday people create movement and activity in this energy field based on the intensity of their focus and the quality of their intention. These are the laws by which everyone creates their life experiences. By learning to consciously work with these laws, the desired conditions and experiences for an ideal and harmonious life can be achieved. There are also laws of vibration, synchronicity, rhythm, gender, and motion which explain the orderly mechanics of the universe. By understanding that there is a common field of power, force, and energy which all people share with the universe so the same laws and principles apply equally to both, then people can understand the universe by understanding themselves. This is why it has been stated many times and in many different ways that the entire universe exists within a human being. Many great philosophies and religions have suggested that we live, move, and have our being in the mind of God. The aforementioned laws and principles govern the mind of God, and ultimately, govern humanity. Consciousness has 3 qualities or aspects of knowing, thinking, and doing. These qualities correspond to the functions of conception, creation, and formation respectively, and each of these levels is necessary for the physical manifestation of thought. Simply conceiving a thought does not bring it into manifestation. However, when one speaks a thought or acts upon a thought, the creative word and action give form to it and make it become reality. The universe responds unfailingly to an individual’s thoughts and desires. Being created in the image and likeness of God makes one a creator also, hence the saying, “Be careful what you ask for.” The self-awareness and management of the active and passive thinking which streams through our mind daily is the key to changing and reorienting our lives. Reorientation and transformation of consciousness is the method for creating an internal environment of discovery and realization. The reorientation of one’s perceptions and the transformation of misconceptions opens the door to release misunderstanding and receive new and fresh insights. The preparatory stage for approaching Self-realization becomes a process of dying to the old and being reborn to the new. Self-realization is attained by neutralizing or working through 5 illusions of the sensual world, these are in: the gross matter of the body, the vital energies of the body, the body-mind (the collective sensations, primal impulses, instincts, fears and anxieties of the body), the intellect, and the veil of ignorance, meaning the illusion of the ego-persona which overrides the presence of the spiritual Self. The nature of consciousness is movement and life, not stagnation and death. Consequently, conscious awareness continuously seeks to transform itself by releasing outdated perceptions and gaining new insights on ever higher levels. Awareness on higher levels leads to change in perception for the individual. This cycle is the creation loop: transformation or a willingness to reorient the present reality; re-Creation or acceptance of a paradigm shift; and realization of a higher state of consciousness. At this higher level, the process begins anew: transformation, re-creation, and realization ad infinitum. The nature of being human is to strive for perfection from the state of imperfection. This means each person is intimately connected to and involved in the unfolding mystery of Creation. True self-awareness comes only when we make an effort to unravel the mystery of life, to remember who we are, and to understand how we have been configured by the Creator. In order to learn about our spiritual nature, the mysteries of Creation, and the creative potentials which lie dormant within, we have to be open and receptive to higher knowledge through new experiences and fresh insights. Reorientation is about releasing one’s concepts of worldly illusion and embracing the energetic “field of play” that is consciousness. To understand this field of play, it is necessary to realize that different experiences take place on different levels of consciousness. (See diagram above) Becoming familiar with the nature of these levels makes it easier to maximize the transformation process, eliminate problem areas in life, and keep the creative life energies working toward manifesting higher and clearer states of being. This process empowers the individual to embrace each new challenge in life, no matter how troubling, as an opportunity for growth and realization. The first step in any change-process is self-evaluation; fearlessly identify the negativities which have accumulated in life, such as: past resentments, hurt feelings, destructive habits, self-sabotaging behaviors, and troubles from relationships. Become aware of any disharmonious thoughts or feelings that interfere with the knowing of our true spiritual nature… the center of empowered light and stillness within. Only by making the effort to know this empowered light and stillness can the individual begin to recognize certain elements in life which have a negative and counterproductive influence. These emotional and mental obstructions from our past exist within as various kinds of fear, pain, misperceptions, and insecurities which skew our perception and judgment. Depending on their nature, these obstructions are retained in the physical body, the body-mind, and on different levels of the soul and present their disruptive energies whenever thoughts or circumstances release them. Most people are oriented toward identifying with the physical body and the sensual world, thus we are bound to the realm of duality. The main source of information comes through the body and the senses, which puts everyone in a reactionary state with regard to life’s events; thus, they remain attached and subject to the roller coaster cycles of life. As long as this condition persists, people will struggle and periodically suffer, not knowing why. The move into higher consciousness depends on the elimination of these negative influences from one’s life. Clarity of mind, balance of emotions, certainty of judgment, strength of will, and clear perception are the characteristics which need to be present in life. To achieve this, it is necessary to make peace with the past by releasing parts of the life experience that retain unresolved issues and drain life’s energy through negative emotions. Freedom from the negativity of the past enables one to be clear, free and fully in the present moment; this is the goal of spiritual development. People often look to God when the need to resolve this dilemma becomes urgent. They adopt a set of beliefs in hopes that this will keep them in good graces and bring order to the chaos. Often it does, but not because they have pleased God by this new found devotion. The improvement comes because they believe it will. Jesus said, “It shall be done unto you as you believe.” This statement indicates the solution to the problem; namely, that if people ever hope to be free from the world of suffering, they must take responsibility for their thinking and believing. Right thinking leads to well-founded beliefs; when these beliefs stand the test of time, they become inner knowing; and inner knowing leads to right action in living. In order for us to become conscious of our creative potential, we need the challenges that life brings. This physical plane experience is the only way to develop spiritual awareness and conscious knowing of Self. This is the way it was intended to be; a self-conscious being experiencing life in a miraculous realm of illusion. Why are we here in this elaborate charade? The answer to that question has been reiterated countless times throughout recorded history: to grow and learn about one’s true nature. What other reason could there be? No one can take anything with them from this life except the essence of the experiences which are retained upon the soul. Reorientation and transformation are the keys to removing illusions, misconceptions, and misunderstandings from the conscious awareness. Being clear in consciousness so as to perceive the truth within will insure that the essence of the soul which is carried forward from life to life is pure, clear, relevant, and correct. In order to reorient consciousness, it must be recognized that misconceptions and misunderstandings are dangerous illusions which prevent people from seeing and experiencing life as it was meant to be. Unless we make a conscious effort to recognize and break free of our misconceptions and illusions, we will experience a distorted and inaccurate picture of reality. By seeking knowledge of the higher Self within, we will come to understand the world of consciousness and energy in which we live. We will understand that we are a being comprised of vital life, higher intelligence, and Conscious Light, all integrated into the miraculous body of physical matter. Reorienting the awareness to these multi-dimensional states of consciousness is to awaken the creative potential within. If we are courageous enough to walk the path of Light, we will have the opportunity to realize the power these spiritual capabilities can have upon our life. The spiritual essence within is comprised of exactly the same spiritual essence as that of the heavenly worlds. As we embrace the Light within, we embrace the Light of heaven. As we penetrate the knowledge of the internal Light, we learn the mystery and truth of the heavenly Light. For those who are willing to take this journey, it is important to read (straight through) the four Gospels, Acts and the Letters of Paul (not Revelations) to find the teachings which inspire you. It is through these teachings that the Spirit will inspire and guide you, and in your personal self-development, Christ will enlighten you. A few steps on a holy journey that was always meant to be.